Anxiety on test day can make you feel like you’re alone in the wilderness. You might feel trapped in your own mind, afraid that one wrong answer could collapse your entire semester (or future career.) The next thing you know, your mind has wandered so far that you’ve only managed to answer a couple of questions. Meanwhile, the clock ticks faster and faster. If this experience sounds familiar, you’re far from being the only one. In his book Anxiety in Schools, psychology professor Jerrell Cassady notes that between 25 and 40 percent of students experience test anxiety to some extent. Just the thought that a quarter of your class is also worried can be enough to settle you down. We’ll talk more about that later. The cause of test anxiety can be any combination of cultural, genetic, or behavioral factors. Fortunately, the human brain is one of the most adaptable mechanisms in the world. It may not seem like it in the heat of the battle, but it’s possible to feel calm and even excited on test day. This post will outline 5 strategies that I’ve learned over the years that can help mitigate the test anxiety you’re feeling – whatever variety it might be. How can this be? These elite athletes are performing on a global stage, often with their livelihoods at stake. As Simon Sinek points out, it has to do with how they interpret physical and mental stimuli. Take a moment to consider the signs of anxiety: fast heartbeat, sweaty palms, butterflies, and so on. Now consider the signs of excitement: fast heartbeat, sweaty palms, and butterflies. They’re indistinguishable. The athletes, whether purposely or not, trained themselves over years of practice to interpret nerves as excitement. So, next time you start to feel “anxious” before a test, remind yourself: this is exciting. You’ll be surprised how effective this tactic is—trust me. When Bill Walsh took over as the head coach of the San Francisco 49ers, his work was cut out for him. The organization had endured several embarrassingly bad seasons prior to his arrival, and as a result, the media, fans and even some players expected the 49ers to fail. That was until Walsh implemented a new philosophy. Instead of setting long-term goals like winning the Super Bowl, Walsh prioritized the tiniest details each and every day: wearing uniforms properly, executing plays in practice down to the inch, eating healthy, and getting adequate rest. If the players could do these little things right every single day, the score of the game would take care of itself. There are strong parallels between Walsh’s coaching philosophy and test preparation. Boosting confidence in the classroom starts long before test day. This means taking care of the little things: taking notes every class and reviewing material consistently instead of cramming the night before the exam. The compound effect of this slow, steady preparation is the confidence that you need to ward off those nerves on test day. The downside of thorough preparation is obvious: it’s time-consuming, especially for college students who juggle multiple classes, jobs, and extracurriculars. The key is to find a level of preparation that you can tolerate without overwhelming yourself. Many of us (myself included) don’t breathe in the manner humans are actually designed to breathe. The right way to breath is to use the diaphragm (the muscle under the lungs) to expand the belly. Instead, we take short, shallow breaths using our chest, which limits oxygen intake. Left unchecked, this breathing pattern can cause an endless cycle of stress: we feel tense, so we take shallow breaths. These shallow breaths cause more tension, and so on and so on until you’re in a low-grade state of anxiety all the time. Needless to say, this isn’t ideal when you’re trying to recall material from last week or write an essay on the spot. Breathing deeply with the diaphragm, however, has an abundance of benefits including lower blood pressure and relaxed muscles. This technique can do more than just calm you down, though. It can improve cognitive function as well. A 2016 study from The Journal of Neuroscience discovered a direct link between proper breathing and the ability to recall and recognize objects more quickly. It may seem like an oversimplification, but breathing could be the difference between passing and failing a test. You’re about 15 minutes into an exam when you glance up and see someone hand in their test and strut out of the room glowing with confidence. You look back down at your own test and notice that you’re not even past the first page. The natural instinct here is to panic: Should I be further along? How can he/she already be finished? I wonder how far along the rest of the class is. Even if the whole class finishes before you, it doesn’t affect your ability to do well on the test. Paying attention to anything other than your own test is a waste of time and energy. These can be tough to keep in mind, especially for competitive students, but reminding yourself that your test is the only one that matters is liberating. I know it feels like everyone’s observing your pen strokes with a spotlight, but I promise they’re not. Stay in your own lane. Simply understanding where a single test fits in the grand scheme of your life may be the most effective tactic to minimize test anxiety. Take a moment to consider how much the test matters: unless your degree or acceptance into grad school rides on a single test, chances are you can recoup any losses from a less-than-great performance. 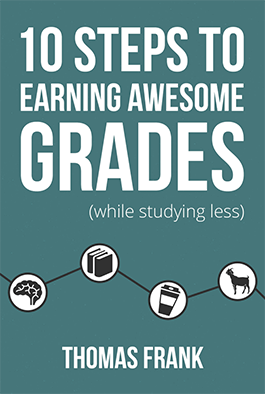 Sure, you want to get good grades – but what’s more important is what you actually learn and retain, along with the experiences and relationships you’re building outside of class. As you may have heard in this interview with Tony Stubblebine, a lot of companies these days don’t care whatsoever about your GPA. Some don’t even want to see a resume – they’d much rather see a portfolio or testimonials. Does this mean you can slack off and play 78 hours of Fortnite instead of studying for your tests? Probably not. But it does mean that, as long as you’re applying yourself outside the classroom, your test scores are not the deciding factor of your future. By implementing these tips, you’re well on your to stress-free test-taking. Just remember: breathe and control what you can control. Most importantly, remind yourself that no single test defines you as a student or a person.